When author Michelle Matthews came home from war, she thought returning alive meant the worst was over. 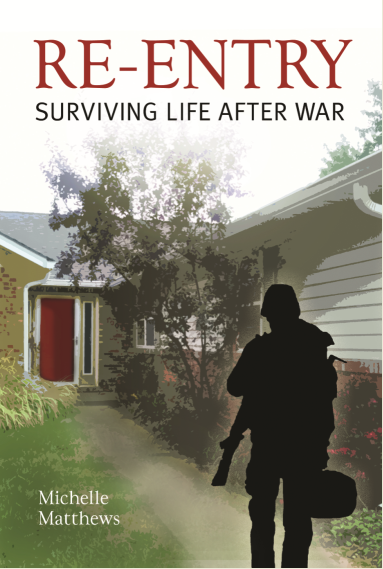 She was mistaken; surviving life after war proved to be equally challenging. Matthews returned a changed person. In Re-entry, she narrates a poignant account of the war in Iraq, its tragic aftermath, and her courageous journey to heal emotionally. Based on journal entries made and e-mails sent before, during and after her service in Iraq, this memoir provides a firsthand account of the trials and tribulations she experienced by her service and gives insight into her emotional journey. Upon her return, Matthews struggled with anxiety and depression and began overeating and abusing alcohol. She tells how she wrestled with thoughts of suicide as she found normal life overwhelming following the abnormal rhythm of war.Re-entry shows that how, through counseling, physical and recreational therapy, journaling, meditating, exercising, and support from family and friends, Matthews found herself again. Michelle Matthews is currently a Major in the Missouri National Guard. She earned a master’s degree in communications from the University of Missouri St. Louis and currently works to help Veterans and transitioning Service Members find meaningful employment. Matthews has served in the Army for over seventeen years.